It emerged today that MS sufferer Marie Fleming was asked by the HSE to provide proof of her condition in order to have her medical card renewed. TAOISEACH ENDA KENNY has said the HSE has “a lesson to learn” in the area of medical card renewal as it emerged today that Multiple Sclerosis sufferer Marie Fleming was asked by the HSE to provide proof of her condition in order to have her application renewed. This year, in a high profile case, the Supreme Court rejected a challenge by Fleming deciding that she did not have the right to end her own life with help from her partner. In a number of media reports today, her husband Tom Curran said he received a letter asking if their circumstances had changed when his wife’s medical card was due to be renewed and was then asked for proof of her medical condition. Fianna Fáil’s Michael Martin took the opportunity to raise the topic with the Taoiseach in the Dáil today, referring to the government’s “change in policy” in relation to discretionary medical cards. He said her case “illustrates what many, many families across the country who have sick people and those with serious medical conditions are experiencing”. “Thousands more are very anxious and fearful of what the health service has in store,” Martin said. Sinn Féin leader Gerry Adams also commented that the state of a health service is a “good indicator” of how a country treats its citizens. 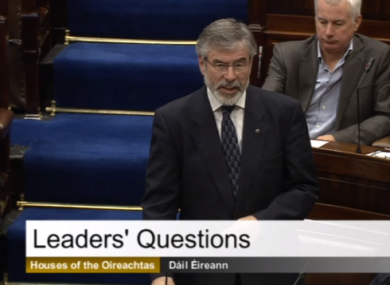 “This is the worst small country in the western world to be sick in,” he told the Taoiseach. Kenny said that while he did not have the specific details of Fleming’s case, he understood that she was in receipt of a full medical card, rather than a discretionary one, as she is entitled to it on both income and medical grounds. He said it is part of the “ordinary renewal process” for medical cards to ask if a person’s illness persists. However he said “a person does not become un-terminally ill” and that there is “a lesson to learn” from this. Unfortunately this case points out where a change must occur in the process of renewal so that people don’t have to deal with verification. Kenny said there should be an “effective and compassionate and understanding process of continuation of the cards”. Email ““This is the worst small country in the western world to be sick in””. Feedback on ““This is the worst small country in the western world to be sick in””.